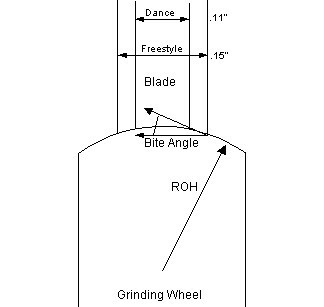 Skate Sharpening Information for freestyle and dance skaters. I have listed below often asked questions and their answers with the goal to take some of the mystery out of skate sharpening and help skaters make knowledgeable decisions about the sharpening of their skates. Besides needing to have a very good and accurate sharpening machine, the sharpener needs to be a skilled craftsperson with a method that makes the sharpening consistent and with a “feel” for the actual sharpening. The answers below come from over four years of sharpening or working with very good sharpeners. As one of the very few sharpeners that actually currently skates and competes I have a good understanding of many of the concerns and anxieties of having ones skates sharpened. Technical information was taken from Sidney Broadbent’s book “Skateology” and many of the questions and answers came from a list by Charles Wright. When reading the questions and the answers, you have a question that is not answered or a comment or suggestion on any of the responses, please email them to me. Send Email Question or Comment. How does the blade move or slide over the ice? Why does the blade turn when I lean? What is the correct hollow for me? What is the difference between a dance and freestyle blade? What does the toe pick do? How is a skating blade sharpened? Is the toe pick ever sharpened? Why does the area behind the toe pick not have a hollow? Why are some blades not flat on the sides? How often should I have my skates sharpened? Are new blades ready to skate on? How can I tell if the edges are level or square? Should I be concerned with nicks in the blade? What does a sharp edge look like? What are templates and how are they used? How should I deal with my skate sharpener? How long should it take to break in newly sharpened skates? My blades feel and look sharp but they don’t feel secure? How can I check or monitor the quality of my sharpening? Why use guards or soakers on my blades? How long should blades last? What are common sharpening flaws? If you apply pressure to ice, it melts. When the blade presses against the ice, it creates a thin film of water, which acts as lubricant to allow the blade to slide. When you are skating, you actually are skating on a thin film of water. Next time you skate, glide straight ahead on the blade. Using your ankle and nothing else, tilt the skate to the right or left, and feel how it turns you in that direction. View the blade from the side and notice how it curves up at the front and back (it has "rocker"). Pressed into the ice, a short length of it is actually in contact with the ice. As it is tilted onto an edge, you can probably envision that this length of contact is slightly curved. As the blade moves along the ice, it will follow this curve. The curve will be deeper if you lean your ankle more. It will also be deeper if your blade has more of a rocker, as most blades are toward the front. As you glide on an edge, press slightly forward on it, and feel how it tries to curve more. You probably know that your blade has two edges, inside and outside, and that there is a "hollow" between the edges. You may also know that the hollow can be "deep" or "shallow", and be able to feel the difference by running your finger across the blade. Refer to the following figure showing a cross section of a blade. The blade is made of a piece of steel of some thickness (a typical freestyle blade is about 0.15" thick). The bottom of the edge is ground out with a circular cross-section (see "how is a blade sharpened", below). The radius of the circle is called the Radius of Hollow (ROH). The shorter the ROH, the "deeper" the hollow. A blade with a deep hollow will hold the ice better, but will also be grabbier and slower. This is a very individual matter. I will state some facts, and then some opinions. An important thing to note is that the ROH (see question "What is the hollow") does not tell the whole story about how a blade feels. The blade touches the ice only along the edges, so what's really important is the angle between the side of the blade and the bottom of the blade at the edge. Some blades are wider than others. For example an MK Phantom is 0.155" wide, an MK Dance is only 0.11" wide. If you have a geometric mind, you can probably see that, given the same ROH on the two blades, the wider blade will have a sharper angle at the edge. So, to give the same strength of edge, narrower blades will need a shorter ROH. A more acute edge angle (deeper hollow) makes the blade less likely to slide sideways, so a deeper hollow gives more secure edges. There is more to it than that, though. It also makes the blade more determined at going where IT wants to go, so it will be harder to control (more likely to grab or "catch an edge"). And, the deeper cut into the ice causes more drag, so the blade will be slower. Given these tradeoffs, one could state that the optimum ROH is one which is just deep enough to give the skater the required edge security. Learning proper use of the ankle to control edges is important, and a shallower hollow facilitates this. As the skater becomes more advanced, they are likely to use a deeper hollow to gain security of the edge. This may be especially important to advanced freestylers desiring edge confidence on jump takeoffs and landings. On freestyle blades, I see ROHs varying from 7/16" to 5/8". The following graph shows bite angle versus ROH for various blade widths (The MK Dance is 0.11" wide, Wilson Dance is 0.14" wide, most skates are 0.15" wide, Phantoms are 0.155" wide at their widest part). Given a desired bite angle and the width of your blade, you can look up the radius of hollow required to give that bite angle. A 10-degree bite angle is pretty deep, and a 7-degree is fairly shallow. Note that on side-honed blades, (Phantom, Gold Seal and Gold Star) the side of the blade where it meets the ice is cut at an angle to the plane of the blade, so the bite angle is effectively increased by this amount. On side-honed blades this angle varies between blades, but appears to be between 2 and 3 degrees. An exception is the Phantom Special, on which the side is cut at an angle of about 9 degrees! Note that the geometry is slightly different for this case, so the blade will behave differently than one that simply has a very deep hollow. If you look at the blade from the side, you will see that it curves from front to back. This is the rocker. Blade companies generally specify the "rocker radius" for their different blades. If you draw a circle of this radius (typically 7 or 8 feet), approximately the back 2/3 of the blade will have a fairly circular contour that matches the arc of the circle with a 7 or 8-foot radius. The radius of curvature decreases toward the front (there is more curve), giving the blade a complex shape. The increased curve toward the front of the blade has an interesting effect. If you move your weight forward on the blade while on an edge, it will want to turn on a deeper edge. You may know that you spin on this part of the blade. You probably have also felt how the blade can grab if you rock back on it while spinning. A long radius of curvature gives a faster, more stable blade. This is why speed skates have very little rocker. It also gives less maneuverability, which is a reason why figure skates curve more at the front. MK blades are mostly specified to have a 7-foot radius and John Wilson blades have an 8 radius specification. A recent check of many new blades indicated that the MK blades were pretty close to their specified 7-foot radius, while Wilson blades were closer to 6. Of more concern is the considerable deviation that is seen, in the form of local "humps" in the rockers at various points on the blade, of both brands. Their specified radius is not precisely controlled. A good sharpener can detect these “humps” and usually correct the rocker. Of course, it is also quite possible that careless sharpening can introduce such problems as well. What is the difference between a dance and freestyle blades? First, dance blades are shorter. Dancers tend to do a lot of tight footwork, and the short heel gives less to get tangled up (step on, lock with your partner's blades or your own, etc.). Secondly, they don't tend to curve up as quickly on the front, so they are not particularly good for jumps and spins. Also, they do not have the pronounced toepick that is seen on freestyle blades, since they are not expected to be used for jumping. Dance blades are less forgiving than freestyle blades. Many dancers have experienced getting their weight too far back and falling over backwards. Some styles or brands of dance blades are narrower than freestyle blades. There are two parts of the toepick, the part that hangs down (the drag pick), and the part that sticks out in front (the master picks). The drag pick is the last thing to leave the ice on an axle, the first thing to touch on a jump landing, and it just touches the ice on most spins. If you rock forward on the blade, you can only go so far before hitting the drag pick. This forward most point is called the "Forward Balance Point". When you spin, you are skating on this point, with the drag pick just touching the ice. Because of the drag pick, you cannot skate on the length of blade between the forward balance point to the drag pick. The skate is sharpened with a rotating grinding wheel. Prior to sharpening, the wheel is "dressed" (using a special diamond-tipped tool) in such a way that it has a circular cross-section (whose radius is the Radius of Hollow). The skate blade is clamped into a holder, which holds its bottom surface perpendicular to the grinding wheel. Your friendly skate sharpener moves the clamped blade along the rotating grinding wheel to refresh the hollow in the bottom of the skate. The sharpening machine has a special guide to keep the blade perfectly aligned with the grinding wheel. The goal of the sharpening is to remove just enough metal from the bottom of the blade to renew the edges. A steady hand is required, so that no part of the blade is ground more than another. Yes. You can see that after a blade has been sharpened many times, the profile of the edge should be the same, but closer to the boot. If the drag pick (see question "What does the toepick do?) has been left untouched, the drag pick will be at a different relative position than when the blade was new, and the skater's technique will change to accommodate this. It is therefore desirable to occasionally remove tiny amounts of material from the pick, so that the profile is retained. This area between the toe pick "drag pick" (see question "What does the toepick do?) and the forward balance point is a non-skating zone that does not come in contact with the ice. Most new blades are not sharpened in this area and thus no hollow. Large wheel sharpening machines cannot sharpen in this area without hitting the toe pick (drag pick). Sharpeners with small wheel machines usually start their cutting in this non-skating area and even the pressure as they move along the blade. This is also less likely to cause a flat spot on the blade at the forward balance area. Generally, less expensive blades are of constant thickness, with flat sides. As you get into the more expensive blades, you may see two features: they may be tapered from front to back (wider at front, narrower toward back), and they may be "side honed" (material ground from the sides so that instead of being flat, they are concave). Depending on the blade design, side honing may create a sharper bite angle at the edge. It definitely makes a blade harder to sharpen with level edges. A blade design variation worth noting is the "Coplanar" and “Ultma”. These blades have the high quality steel and stronger construction of high-end blades, but are of constant thickness throughout, thus easy to sharpen well. In addition, they have a unique mounting geometry with certain claimed advantages (because of their flat mounting plates, they can be repositioned on the boot without changing the blade angle.). "Before they need it". It depends on how much you skate and how hard you skate. If your edges are damaged or no longer feel secure, then it's certainly time to get them sharpened. I try to remember that nice feel of freshly sharpened skates, and when they don't feel that way, it's time. Generally, to keep the sharp feel all the time, and not have to get use to just sharpened skates, have them sharpened between 20 to 30 hours of skating. If you stay with the same sharpener, sharpening often will be more like a touchup and, if done correctly, the blade will still last five to eight years. If you examine the bottom of the blade right after sharpening, the bottom of the blade will have a uniformly satin sheen. With more skating, the blade bottom near the edge, under different light conditions, will begin to appear dull. These lines along the edge of the blade are the starting of “flat spots” or a “dull” blade. Figure skate blades generally come from the factory already sharpened. My observation is that this sharpening job is generally of low quality, unlevel edges and the factory ROH (see question "What is the hollow") may or may not be appropriate for the particular skater. Always sharpen new blades before skating on them or at least have them checked by your skate sharpener. Ideally, the centerline of the hollow is halfway between the two sides of the blade. If it is not, one edge will be higher than the other and will have a sharper bite angle. If too far off, the effect will be asymmetrical edge strength (for example, inside edge grabby, outside weak), and flats that want to turn. Your skate sharpener should always check that your edges are level after sharpening. A common way to make a rough check is to balance a coin (or other straight edge) on the bottom of the blade and "eyeball" it. I think that this method is really too imprecise to detect any but really gross errors. I use a miniature, precision machinist's square to check that edges are square with the side of the blade. Other devices for checking this are also made. Note that side-honed blades are much more difficult to check, because the side of the blade is not flat. Not really. It is extremely important that any deformation of the metal on the side or bottom of the blade, next to the nick be ground away. I observe that a slight "hole" in the edge is generally not noticeable, and, in the interest of prolonging blade life, large nicks are generally not completely removed. If you examine a sharp edge in a strong light, you should see no reflection from the edge, even looking with a strong magnifier. Templates are like patterns or outlines of a blade to the manufacturers original specifications. Templates are most often used to restore a flattened rocker, damaged from bad sharpening. I suggest that, once you find a skate sharpener that you like, stick with them. The reason for this is simple. Every skate-sharpening machine has slight differences. A blade can be resharpened on the same machine with minimal metal removal, protecting your blade investment. Each sharpener also has his own touch or feel for the sharpening. You should be prepared to interact a little with the person who sharpens your skates. Hopefully, they will be willing to discuss any problems that you perceive. For the first sharpening, find out how far off, if any, the blades are. Decide if you want them corrected in one sharpening or over several sharpenings, or have your coach talk with your sharpener and make these decisions. Always leave your name and phone number with your skates to be sharpened, in case the sharpener has questions for your sharpening. Your sharpener should keep detailed records of your skate sharpenings and be willing to review them with you. After your first sharpening, your sharpenener should be able to match exactly what you have each time. When you buy new blades, take a few minutes to trace their contour on a piece of paper. Occasionally, after sharpening, compare each blade to this contour and note any visible changes to the rocker. In particular, if the same person has been sharpening your skates, visible changes are something he would want to know about. Most skaters are conditioned to expect a bit of an adjustment period after having their skates sharpened. The common symptom is that skates feel "grabby"; edges catch, and stopping is difficult. Skaters with newly sharpened skates are often seen doing things like dragging their skates sideways on the ice, running blocks of wood along their blades, etc., to dull them into skateability. The correct expectation is that properly sharpened blades should have little or no adjustment period. They should never feel grabby. They should simply feel more secure. (exceptions are those cases in which changes are made to a blade, such as correcting previous sharpening errors or changing the depth of hollow, or sharpening an exceptionally dull blade). The edge of a well sharpened blade should feel very smooth as a finger is run along the edge; proper edge finishing will have removed the metal burrs that can cause grabbiness, and give the edge a smooth, non draggy feel. Be careful: a sharp blade can cut (though a well-finished blade is less likely to do so). This insecure feeling on sharp blades can have several causes and possible solutions. Maybe you need a deeper hollow or the hollow was made shallower on the last sharpening. Talk with your coach and skate sharpener. It may be that you are ready for a deeper hollow. There are many pro and cons about using polish on the last pass of the grinding wheel when sharpening skates. Many figure skaters do not like the feel of a polished hollow. Decide on the use of polish for yourself, based on how it feels when you skate and not on what others say. First, you should be alert to any differences in the feel of the blade after sharpening. Are your jumps or spins different? Do the edges grab, especially one more than another? Discuss any feelings or differences with your skate sharpener. This is where having a sharpener, who also skates, will be a big plus. Guards should be used only when you need to walk around when not on the ice. Guards should not be on the blades any longer than necessary. Blades will start to rust in a very short time when wet with the guards on. Soakers should be on the blades anytime the skates are not on your feet. Even though rinks have rubber mats and various other materials around the rink to protect blades from damage – NEVER walk on these materials with your blades. There is a lot of dirt from street shoes, etc. that will quickly dull your blades. If I have previously sharpened a blade, I find that each sharpening removes only about 0.001" of metal (a typical piece of paper is about 0.004" thick) on a resharpening. If there is 0.1" of sharpenable depth on the blade when new, this means that you might get as many as 100 sharpenings out of a blade. With monthly sharpenings, this would give a blade life of up to 8 years. Sharpenings to restore edge level will take off much more metal. So will sharpenings to change radius of hollow. I believe that skaters typically get a much shorter blade life, for various reasons. Still, a careful sharpener can do much to prolong blade life and protect the skater's investment. While the goals for good sharpening are quite easy to quantify, skate sharpening is a manual operation and as such is very much a "craft". The most often seen flaw is unlevel edges. If the centerline of the grinder is not aligned with the centerline of the blade, one edge will be higher (and sharper/grabbier) than the other. The effect of this is that one edge will grab while the other will feel weak. If really bad, the blade will pull to the right or left. To achieve an even grind, the sharpener must move the blade along the rotating wheel with constant force and speed. With time and repeated sharpenings, it is possible that errors will accumulate and show up as uneven rocker. The degree to which this happens is a measure of the skill of the sharpener. Sometimes a particularly heavy hand in sharpening can alter this curve in one sharpening. If when reading the questions and the answers you have a question that is not answered or a comment or suggestion on any of the responses, please email them to me. Send Email Question or Comment.